It snow again today. Yesterday many of the blogs I followed had photos of snow from North California, Kansas City, to Scotland. It is very normal to have snow here this time of year but it is very cold and staying cold and we have so much snow. We have run out of room to pile the snow. I made this some time back but thought it was better to show a quilted snowflake then more snow photos. 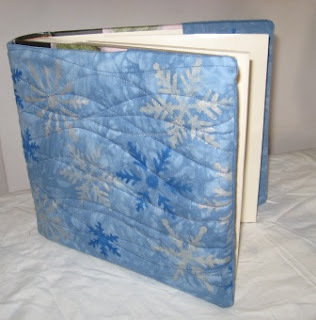 I stenciled the snowflakes on the hand dyed fabric. I got some of my own quilting done again today. The book is lovely Cathy. The snowflakes look so effective against the blue. Which type of paint did you use for the stencilling? I used Shiva oil sticks and a stubby stencil brush to apply the paint. I sprayed the back of the stencil with 505 temporary glue and layered it on the fabric. Thanks for asking.